Note: Since this was first posted, it has emerged that the Atacama skeleton is actually that of a female. You can read more about the latest findings at the New York Times (here). As described in my last post, ufologist Dr. Steven Greer announced last summer that he had gained access to the tiny body then known as the Atacama Humanoid or the Atacama Alien, discovered around 2003 in the desert sands of Chile. It is a seemingly human skeleton with an elongated and peculiar skull, not much longer than a pencil, yet remarkably well-proportioned. Strangely, it has only ten ribs and what appears to be a tooth. Greer said that two top scientists – a geneticist and a foremost expert on skeletal abnormalities – were analyzing the creature, and promised the results would be made known to the world in the documentary Sirius. The film was screened earlier this week in Los Angeles, to wildly mixed reviews. Did I say the reviews were mixed? Yeah, they weren’t. It was terrible. Everybody hated it. And yes, you read that correctly – a Troll 2 fan thinks Sirius is awful. But we did get what Greer promised: The long-awaited findings of the two American scientists who analyzed the Atacama Humanoid. We now know they were Dr. Garry Nolan and Dr. Ralph Lachman. Nolan is a professor of Microbiology and Immunology at Stanford University’s School of Medicine, and Lachman is a pediatric radiologist specializing in the study of skeletal dysplasia (“dwarfism”). After studying DNA samples and images of the body for over half a year, what do these esteemed medical professionals have to say about it? Welp, it’s not a monkey. Or an ape. Or an alien. Or a human-alien hybrid. It’s a six- to eight-year-old child that could fit in the palm of your palm. Think about that for a minute. If it’s not blowing your mind yet, think about it some more. I’ll wait. The body is evidently not – as a I originally suspected – a Piltdown Man or a Nondescript, stitched or glued together from parts of different species for the amusement of some trickster. Greer’s team extracted a DNA sample from the body by surgically dissecting two of its ten ribs. These samples contained bone marrow material. DNA analysis conducted by Nolan (which is ongoing) shows the tiny being is a male human child, probably born to an indigenous Chilean woman. Though its age is difficult to estimate, Nolan guesses it was born sometime in the last one hundred years. According to Nolan, “Obviously, it was breathing, it was eating, it was metabolizing. It calls into question how big the thing might have been when it was born.” You can read a preliminary summary of his and Lachman’s findings here. Working with X-ray and CAT scan images, Lachman found that the skeleton’s bone density and epiphyseal plates were those of a small child, approximately six to eight years of age, rather than a foetus. As you’ll see, not everyone agrees with his conclusions. Bizarrely, Greer states early in the film that the body is extraterrestrial, only to be contradicted later on by his own experts, and his report on the skeleton contains weird references to Martian obelisks and DNA that is 10 billion years old. He still refers to the skeleton as humanoid, and plans to talk more about it at this year’s Mutual UFO Network symposium. If someone can figure out WTF Greer thinks he’s doing, let me know. At this point, we know very little about the boy found in the desert. His body was unearthed by a treasure-hunter in the autumn of 2003. If the account of his discovery is accurate, it seems the boy was given a crude burial beside the Catholic church in the long-abandoned mining town of La Noria, in northern Chile’s Atacama desert. This is a desolate place, once home to one of Chile’s many saltpeter mining operations but now known only as a literal ghost town with a spectacularly creepy cemetery. Eschewing a coffin, someone had wrapped the body in a piece of white cloth, bound it with some purple ribbon, and interred it in a shallow grave near the church. Was the child considered a demon? A curse? A portent of disaster? Stories of “monstrous” human infants, like the legendary Hull House devil baby that terrified Catholics in pre-WWI Chicago, continue to be told even today – so it seems quite likely that devout Catholics in a remote desert town would have been petrified (and perhaps mesmerized) by the birth of a baby that would make Tom Thumb look like a giant. They may have kept the child’s existence a secret, out of shame and fear. It’s even possible the boy was never known to the world beyond his immediate family, or perhaps nuns entrusted with his care. 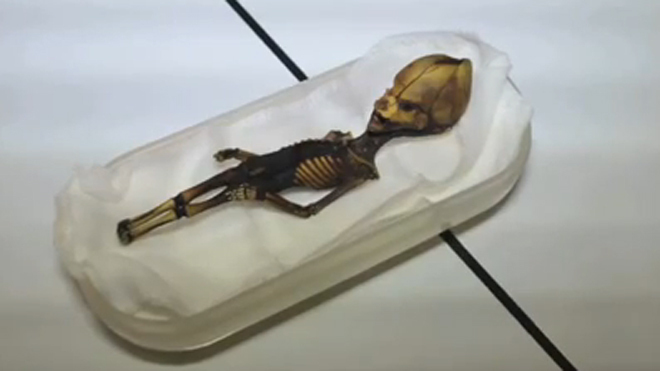 To date, no contemporary reports of a tiny child born in Chile have surfaced. One has to wonder what his brief, astonishing life and untimely death were like. Was he baptized? Was he loved? Did the skull fracture observed by the doctors have something to do with his death? Did a weeping mother kneel beside his grave? As the last residents of La Noria drove away in the 1950s, did they gaze back through the swirls of dust at the little Catholic church and whisper a goodbye to the boy they had never known, but always heard about? After his discovery in 2003, the “horrible dwarf extraterrestrial” was briefly spotlighted in Chile’s tabloid media. Thereafter, he was passed from hand to hand like a carnival sideshow exhibit, finally ending up in the possession of a Barcelona “exobiologist” named Ramón Navia-Osorio. He was treated much more like a collectible curiosity than a scientific specimen, but Navia-Osorio did persuade several scientists to render their opinions on the body. According to an article at the UFO site Open Minds, three physicians X-rayed it and determined it was a complete human skeleton, rather than an assemblage of parts. Dr. Francisco Etxeberria Gabilondo, a professor of legal and forensic medicine at Basque Country University and a specialist in forensic anthropology at Madrid’s Complutense University, declared the body to be that of a mummified human foetus, approximately fifteen weeks old. Greer, on the other hand, decided he was an Extraterrestrial Biological Entity and commissioned Lachman and Nolan to examine him. If the boy had been considered merely a human oddity rather than a possible EBE, it is doubtful he would have regained any degree of attention. I certainly hope that once the alien nonsense fades away, other scientists will examine him and tell us much more about him. They should be able to resolve the disparities between Dr. Etxeberria’s report and the Lachman/Nolan findings. I have only one thing to ask of you. 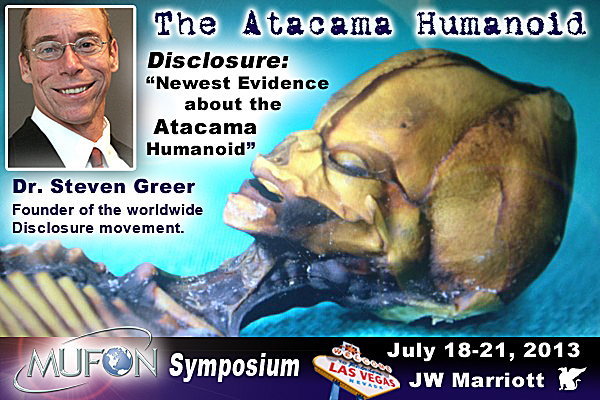 Don’t think of the Atacama skeleton as just another alien hoax, or yet another black mark against Steven Greer, or the over-hyped hook for some goofy documentary. Think of him as the little boy from La Noria. This entry was posted in Hoaxes, Hoaxes from Space, Religion, Reviews, UFOs and tagged aliens, documentary, film, hoax, science, Steven Greer, ufology. Bookmark the permalink. Those last couple sentances actually choked me up a little. Since these are unknown types of abnormalities, I wonder how reliable the age estimate is based on the x-ray density of the epiphyseal plates. I just find it hard to believe such a person could have survived 6-8 years. Might the unknown abnormality (or abnormalities) also have caused unusual ephiphyseal plates? Ironically, I think of this as similar to the UFO problem: if you don’t know what it is, by definition you don’t know just by seeing it how far away it is or how big it is. Quite possible. The consensus (outside of Lachman’s conclusion) seems to be that this is a fetus. Yes, another black mark to Steven Greer, he is getting closer and closer to the non-nonsensical type of mind of Erich von Daniken and Giorgio Tsoukalos. In Dr. Garry Nolan’s words “The specimen was concluded by the medical specialist to be a human child with an apparently severe form of dwarfism and other anomalies .” Is awful to see this crook make idiotic claims about a deformed kid. I feel touched by the possible real story of “the boy from La Noria”, a sad one I should say.